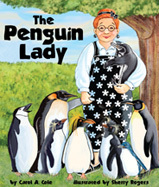 My picture book, The Penguin Lady, is a counting book featuring Penelope Parker. Penelope’s house gradually becomes filled with 10 different species of penguins. They take over the rooms in her house and create a noisy mess. Children from preschool to second grade will enjoy the antics of the penguins. There are four pages of facts in the back of the book and an online teaching guide to learn more about the penguins. The Penguin Lady was awarded the Children’s Literary Classics Seal of Approval in May 2012.